With DC Comics and Disney set to launch their own streaming services soon, I've been thinking about what it would be like if PNP / Toei / Kodansha / Bandai decided to start a new "Sailor Moon" streaming service/site. Naturally such a service would carry the 90s anime and Crystal (with, for the sake of this hypothetical discussion, all available dubs and subtitled in all major languages) as well as the live action series and the musicals (likewise subtitled in all major languages). But, as with DC's and Disney's streaming services, a "Sailor Moon" one would also need some original content. So: What original content would you like to see on a "Sailor Moon" streaming service? Animated series? Live action series? Game shows? Documentaries? Movies? A series set in Crystal Tokyo focusing on Chibiusa as she begins her studies at the academic villa on Moon Island. What does she study there? Who are the teachers? Who are her classmates? The Sailor Quartet and Hotaru, perhaps? Any class rivals? What secrets lurk in the villa's history? There's so much potential here IMO. A Steven Universe / Adventure Time type show set in the Silver Millennium, exploring things like the Outers' defending the Solar System from external villains, Nehellenia's curse, life on all the planets, Snow Princess Kaguya's original attempt to take over Earth, the alliance between Mars and Coronis, Artemis and Luna's home world, etc. A mix of slice-of-life stories, episodic adventures, and occasional overarching storylines. Perhaps even Diana the Moon Fairy could be included? I think this idea could be a great way to explore the story arcs from the manga we already know from a new angle while also allowing for lots of brand new stories. Stealing Rika's idea a bit, I'd also love an SD parody series about the Death Busters: Professor Tomoe's mad scientist shenanigans, the Witches 5 interacting with their fellow classmates at Mugen Gakuen, Kaolinite acting as principal and her various romantic misadventures as she tries to woo the ever clueless Professor Tomoe (a la Our Miss Brooks), etc. 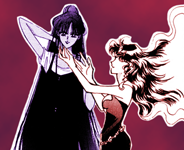 Haruka, Michiru, and Hotaru could also appear. I know its hypoethical but I cant imagine a streaming service specifically for Sailor Moon would do well. I wish that the company who was going to make an OVA didn't go bankrupt. I know its hypothetical but I cant imagine a streaming service specifically for Sailor Moon would do well. I wouldn't be surprised if Toei made its own streaming service one day, but I think a Sailor Moon specific streaming service could be successful if it was available worldwide with an ad-supported free version and a reasonably priced ad-free premium version. (Or even a streaming service dedicated to adaptations of all of Naoko's work. I could see a PQ Angels or Love Witch anime being successful enough, and I think a lot of her earlier work could make for good live action films or drama series.) I mean, I could see J.K. Rowling turning Pottermore into a Harry Potter streaming service featuring various shows and movies set in the Wizarding World. I think niche or brand-specific streaming services could become a thing provided there's enough interest in the particular franchise and enough potential in that franchise to sustain the creation of sufficient content to offer. If the WWE can have its own streaming service, why not Sailor Moon? Not saying it'll ever happen (because it probably won't) but we have fun imagining. Anyway, an X-Files type of series focused on the Supernatural Research and Sci-Fi Appreciation Clubs investigating various weird occurrences around Tokyo/Japan/even the world? would be interesting to see as well. It's a nice what if...but I doubt it. I honestly can't see even that many diehard Sailor Moon fans paying money per month for access to a Sailor Moon-exclusive or Naoko Takeuchi-produced content... Brand specific streams are the becoming the norm, but Sailor Moon's brand isn't strong enough to support an exclusive "channel." In fact Sailor Moon doesn't have enough content to warrant a streaming service. That being said, I'm not unwilling to play along. As mentioned in another thread, I'd want to see a series based on the old anime involving the victims of the episode interacting with each other, as well as the former villains were healed. I'd also like to see a Crystal Tokyo and Silver Millennium series based on the old anime or the manga/Crystal. I'd definitely would like a new anime adaptation, one that combines elements of the old anime, the manga, and other adaptations (including Another Story and the musicals) into one new show. I would also like for it to have new ideas of its own. Like Crystal (and to a lesser extent, PGSM), it would modern the story a little. I also want new live action adaptation set in North American, English-speaking city. It could be LA, Vancouver, Seattle, Toronto, or New York. Hopefully, there would be visibly ethnically diverse Sailor Guardians. It would be interesting if elements were taken from both PGSM and Toonmakers Sailor Moon, but the storyline could follow any version of Sailor Moon or even go in its worn direction. Likewise there could also be other live-action adaptations set in other parts of the world and in different languages. It would be interesting to see one based in Peru, given that the country does have a significant Japanese population/influence. I'd also like to see a Western cartoon version of Sailor Moon closely based on the old DiC dub in story (but with the diversity of shapes and appearances Western series end to have), except even more Americanized in terms of content,, but also with elements of story arcs carrying over from one arc to the other and characters not disappearing from the canvas. Note, how the dub did try to carry forward things from the Dark Kingdom arc under the umbrella of the "Negaverse" and mentions of past characters where they didn't occur in the original....now imagine an adaptation where the Dark Kingdom arc didn't conclude as neatly as it did, with Beryl still out there causing trouble, where Greg actually did appear after the conclusion of the first story arc, and that Alan and Ann were really more closely aligned with the Negaverse (as well as the other villains). I also want new live action adaptation set in North American, English-speaking city. A Tuxedo Mask spin-off set during Mamoru's/Darien's year abroad studying at Harvard could be an interesting way of doing something along those lines. 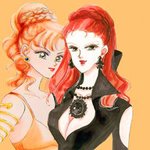 A sailor v online flash game and a trading service where people can trade scam free!